Manuel Mill. Not nearly as early as the one seen in a later photograph, along with a description of what can be learned from the photo. Courtesy of Duda Williams family. This must be a very old photo. Was there a connection between the Stephens Brothers who published the picture and the Stephens Cash Store in downtown Murphys, corner of Main and Church Streets? Your editor thinks there probably was. We have photos of mule teams, horse teams, but no ox teams for the website. The museum has photos of an ox team on its walls , plus a photo of two oxen combined with a team of mules. So, we know that the Manuels used oxen at one time. 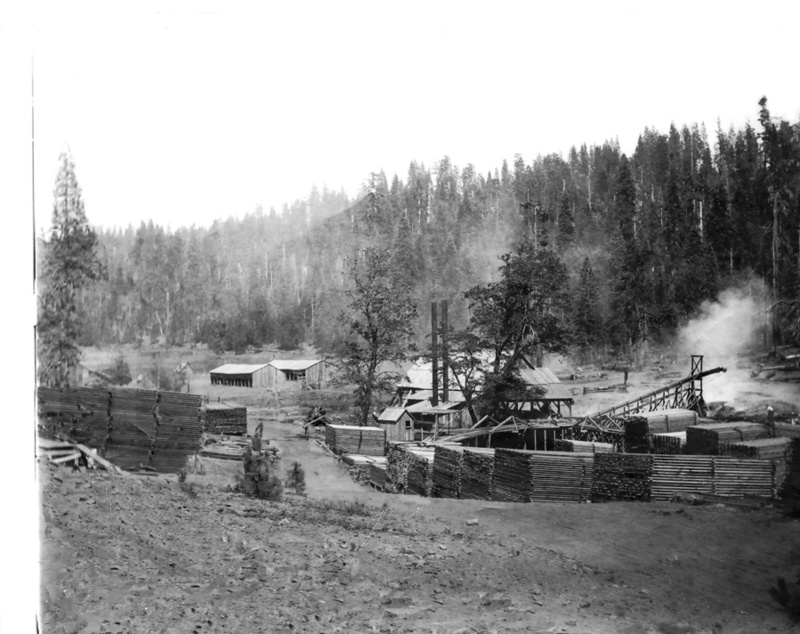 Charles Lane, owner of the Utica Mine in Angels Camp had told John Manuel that he would take whatever timber the Manuels could cut. 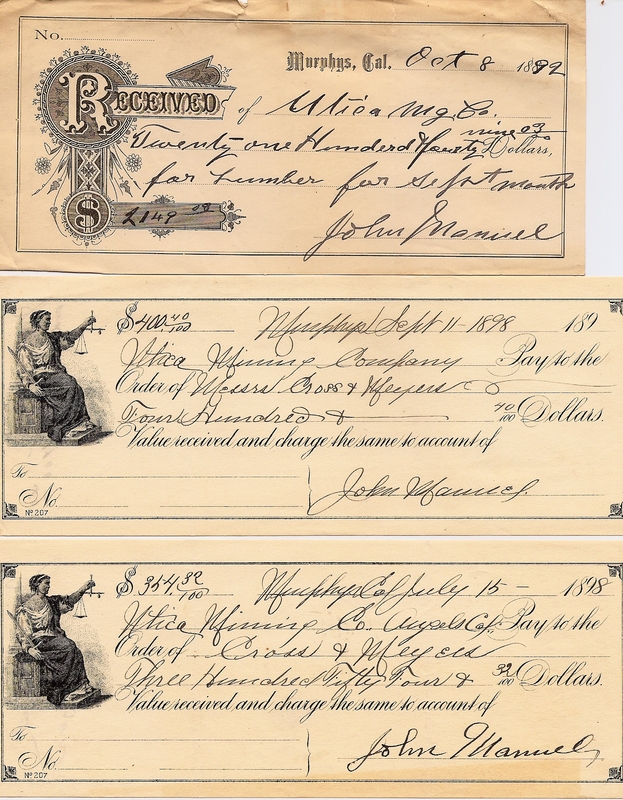 The first of the items below is obviously a receipt from John Manuel showing that he had received that amount of payment from the Utica Mining Company. Are the other two receipts? Not sure. Clicking on the document will enlarge it and give you a very clear image of what each of the mills delivered and how much they got paid for the timber. More than one local historian mentions that Manuel’s original mill, sometimes referred to as the Avery Mill, eventually burned. Linebaugh and Fuller write that after this misfortune the Manuel family purchased the Raggio Mill and “moved it to their last site, on San Antonio Creek, about one mile above San Antonio Falls” (Linebaugh and Fuller, no date, unpub. Ms: 95). 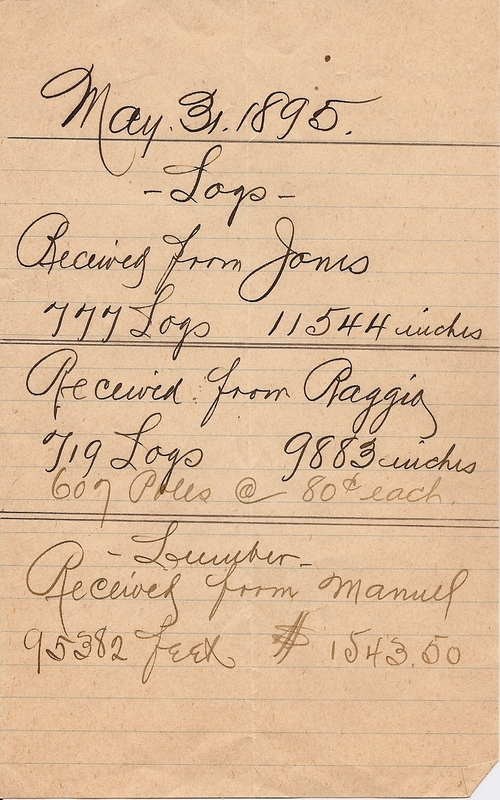 This information is confirmed in the 1986 issue of Las Calaveras, where it is stated that the purchase of the Raggio Mill by the Manuel family brought an end to milling operations by the Raggios. The same article states that this transaction and the moving of the mill to its new location happened in the mid-1920s (Las Calaveras: Oct. 1986: 38). Mule team possibly in Murphys? The Manuel Mill on San Antonio Creek (1923 -1953) was a steam-powered mill that, although previously used, would have been considered up-to-date from an industrial standpoint. Although steam-powered mills existed in west coast industry as early as 1850, many mills in Calaveras County used water wheels for power as late as 1870 (Ficken 1987: 23-25; Davis 1993:10). 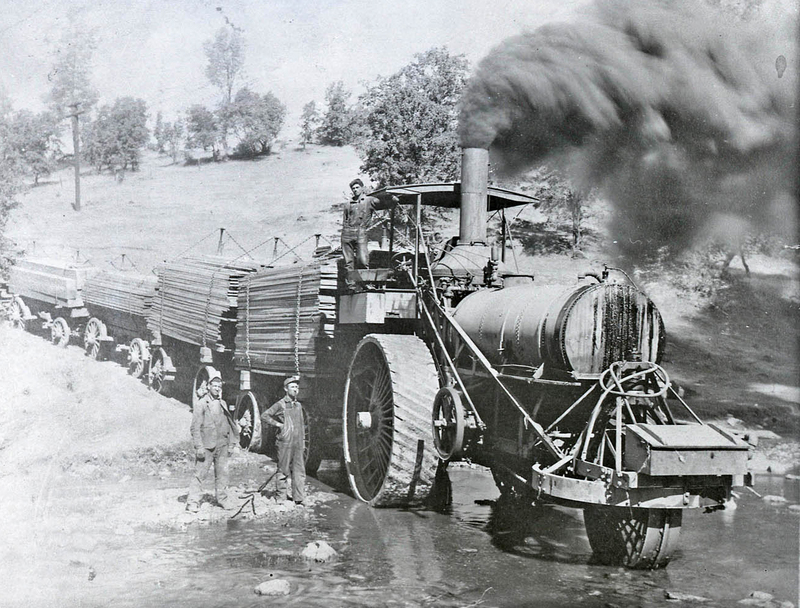 In 1868 the California State Agricultural Report noted that in Calaveras County five mills had steam-power while six were powered by water wheels (Las Calaveras Oct. 1986:32). This listing of eleven mills is extremely conservative; there were many more. Water mills had abundant problems when streams ran low or dry in late summer. For this reason and others, by 1900 most Calaveras mills used steam to run their saws, with donkey steam engines hauling logs to landings in the forest. 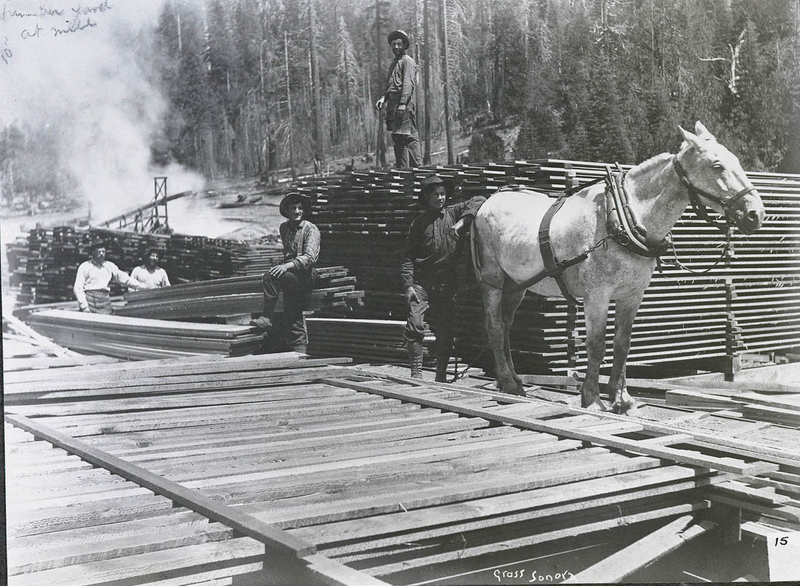 One early photo reputed to portray the Manuel logging operation shows a capstan-style donkey of the Dolbeer type, suggesting the use of steam by the Manuels as early as the 1880s, when steam donkeys were first introduced on the west coast. Unlike later donkeys, capstan-style donkeys had cable spools that sat vertically as shown in this picture of a young man leaning against the cable spool. The Manuel Mill employed from eight to ten workers, according to Cecil Giles, who worked above the mill in a drying yard, in the mid to late 1930s (Cecil Giles 1994: pers. comm.). The former drying yard is the location of the Mill Woods subdivision today. Bob Porovich, who first worked at the mill in 1929, says there were 30 or 40 men altogether, including those who worked in the woods, cutting and hauling trees (Bob Porovich 1994: pers. comm.). The editor of The American Eagle article says the mill “was erected with ease of working and a minimum of operating manpower in mind” (The American Eagle 1945: 2). Edwin Manuel remembers only a few workers’ names, but he does recall the number and titles of jobs. He and another man were “tail-offers,” meaning they caught and sorted lumber and slabs (including scrap) handed or thrown to them by one of the two “off-bearers.” These last workers “flipped cut lumber and slabs off as they left the saw.” There was a carriageman who ran the log carriage back and forth along the grain of the log as it was ripped, and an engineer (named Shorty) ran the steam engine that powered the saws (Edwin Manuel 1994: pers. comm.). A man was needed to collect dried slabs to deliver to the fireman, and Bob Porovich did that for a season before he became a trimmer, operating five saws (Bob Porovich 1994: pers. comm.). Perhaps the most important job was the sawyer’s. His name was Guy Supinger, and in 1945 he had held this job for 14 years (The American Eagle 1945:3). This excellent photograph of the mill, taken in 1936, indicates its approximate dimensions (Calaveras County Historical Society Collection). The photo was taken beside the millpond, looking downstream, along the eastern edge of the pond, facing north. The mill is centered in the picture and shows the steep slope between the pond and the drying yard across from it. In the foreground, floating in the millpond, are four logs ready to be drawn up the slip into the mill. The slip, or log-ramp, appears to be on a 25 or 30 degree angle and is placed at the center of the main building, which may be estimated to be 35 feet wide and 30 feet tall. The entire end of the structure, built from milled timbers about 10 x 10 inches wide at their bases, is open and has one large crossbeam spanning the corner posts below the roof. In essence, this post and beam structure is an open shed with angled struts and crossbeams to support it. It appears to be about 80 feet in length, with a peaked roof covered with corrugated tin, exactly like the roofs on large sheds and barns seen today. This photo is packed with information. The logs floating in the pond are not especially large and are, presumably, the usual size the mill processed, with butts approximately three feet across and lengths of about 16 feet. The circular saw blades, 60 inches in diameter, were of a size suitable for making lumber out of medium-sized logs. One of the logs in the foreground of the photo looks like a sugar pine. Manuel, like Blagen at a later period, must have made lumber from a variety of timber. After logs were turned into rough-cut lumber they were loaded (by hand) onto a tramcar, which was a short, squat, narrow gauge railway car. This small flatbed, no more than eight feet in length, had four spoked metal wheels with flanges (Cecil Giles 1994: pers. comm.). From the top of the steep slope visible in the photograph of the mill, a donkey engine reeled in a cable attached below to the tram. 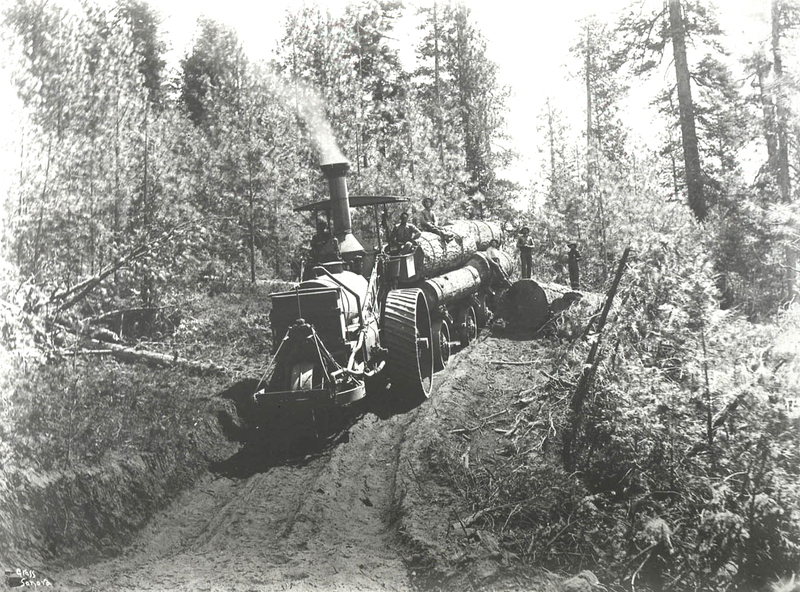 Such an “incline system” was not unique in local logging. 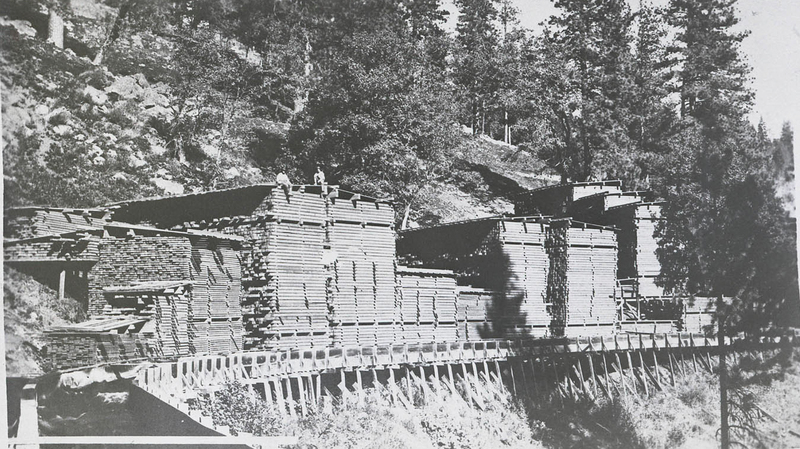 A Raggio Mill on Cowell Creek also used a small railway incline to lower logs or to tow lumber upslope from its mill. But the incline at the Manuel Mill may have been unique in the length and craftsmanship of its trestle. This trestle, which supported the tram on rails, was built several feet above ground, allowing the mill’s transportation system to function even in snow. A 1945 photo of this incline was printed along with the article on the Manuel Mill (The American Eagle, 1945). Lumber loaded on the tram was looped once with a chain, and this chain then hooked to the towing cable (Bob Porovich 1994: pers. comm.). Once the lumber reached the top of the 1800 foot incline, the tram was unhooked and pushed by hand along one of the narrow gauge sidings that fanned out in the lumber yard behind the donkey (Cecil Giles 1994: pers. comm.). Another team of two men unloaded and stacked the newly cut lumber, and then Mr. Giles and his partner pushed the empty tram back to where it could be hooked to the donkey and lowered to the mill. More than a single tram was used, enabling one tram to be loaded at the bottom while another was being towed. All sources indicate that the mill employed more Native Americans than Anglo-Americans or any other group. Cecil and Betty Giles suggest that one reason for this was that Indians were more numerous than Caucasians in the immediate area of Sheep Ranch and Avery. But Ambrosio Castillo believes Matt Manuel hired more Indians than others because he could pay them less (Ambrosio Castillo 1994: pers. comm.). No one really knows Matt Manuel’s reasoning in this matter. 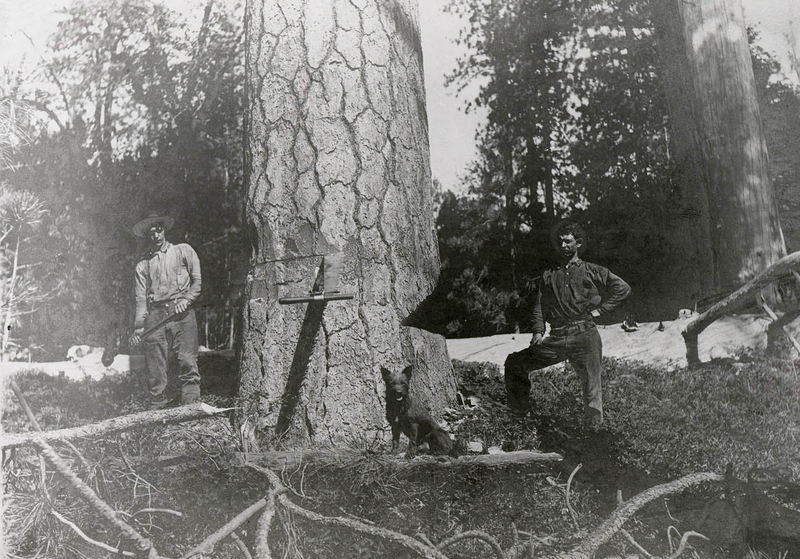 Robin Inks says some Indians also worked in the logging operation, and adds that at least one of the fallers was a Swede, which accords with a tradition, or pattern, evident in other parts of the Sierra and, for that matter, other parts of the entire Far West. Swedes and other Scandinavians were often fallers (Woirol 1987). Interesting photo of a Manuel logging train. In regard to the incline you see coming down the hill, your editor has no idea of what it was. The Manuel mill had a “chute” down which logs were sent down the hill into the mill pond. There was also an incline using rail cars to take green lumber from the mill to a drying yard at the top of the hill. It doesn’t look to me as if this is either of these. 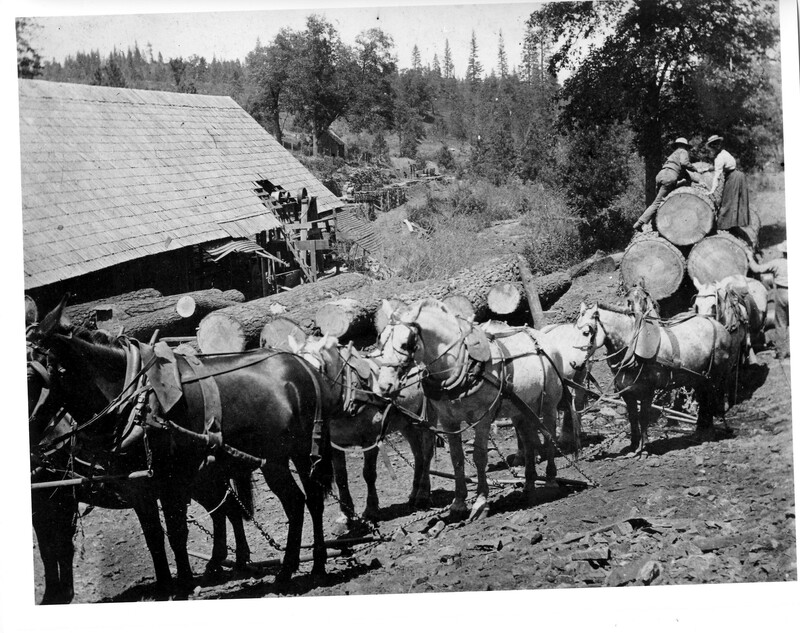 Transportation from the stump to the mill was accomplished in early logging throughout the west by towing logs with yoked oxen, horses in harness, or with mule teams (Fisher 1908; Bryant 1913). 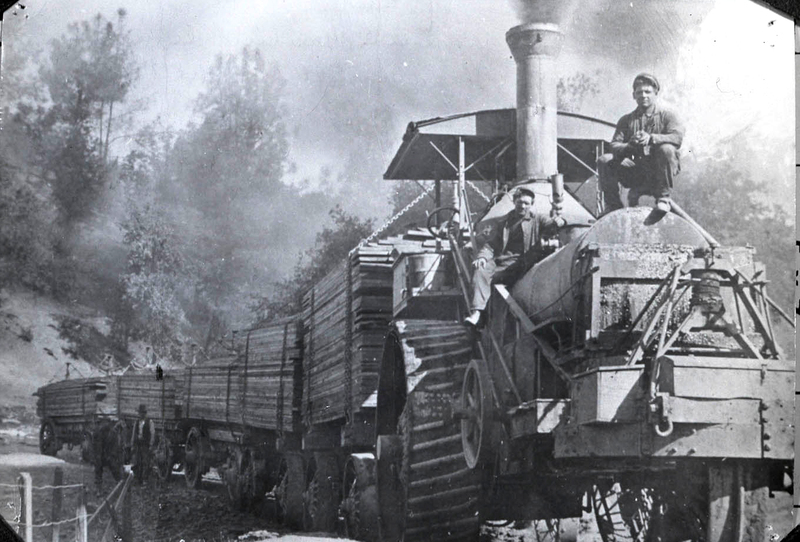 After 1881, when John Dolbeer introduced the “donkey” steam engine (adapting it from nautical use), steam revolutionized log transportation in the woods. Log chutes (long, log-lined channels usually excavated in the forest by dragging a few logs over the route in a straight line) increased the speed and efficiency of transporting timber to the mill. In the Plumas National Forest a few of these were between one and two miles long (Orr 1919). 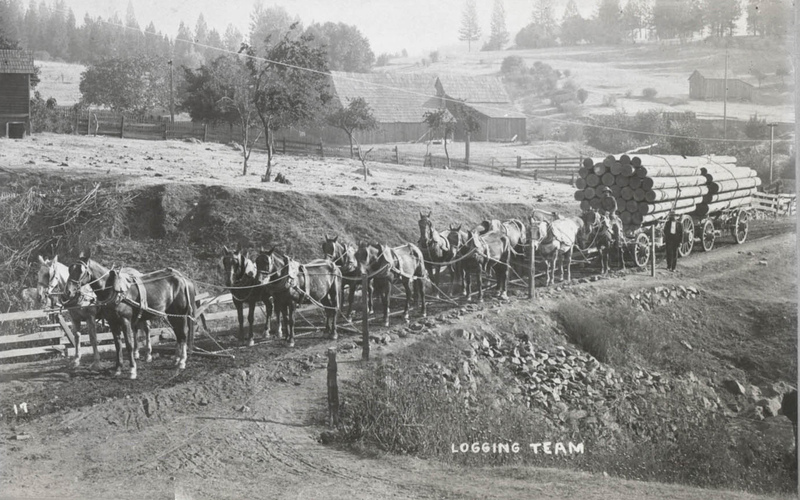 Before steam, logs could be propelled down chutes by gravity in some areas; or, in the case of “trailing chutes,” draft animals towed several logs hooked together in a line called “a trail of logs.” But by the mid-1880s, steam engines called donkeys had replaced real animals in many parts of California. Using block and tackle systems with long cables, donkey engines could be placed in towing positions at either end of a trailing chute. Their cables wound onto large low-geared drums. The Manuels used two steam traction engines, one of which, Old Beth, can still be seen at the Angels Camp Museum. Bob Porovich remembers a log chute that ran all the way to the Manuel millpond, on the north side. It was a roughly constructed affair, a groove in the earth lined with logs that kept towed logs from digging into the ground and causing hang-ups or cable breakage (Bob Porovich 1994: pers. comm.). This chute was a typical trailing chute of modest proportions. In the 1920s only a few loggers still used real animals to tow logs to the mill or to logging truck landings. Unlike draft animals, which needed constant care, donkeys did not die unexpectedly, get tired, or need to be fed anything but wood. When they did get old or broken down, there were mechanics called ‘donkey doctors who could diagnose their malfunctions and repair them (Clark 1954: 26). The Manuels, according to Bob Porovich, also used another early log transportation system. This was the spar-pole system sometimes called high-lead logging. A donkey engine was anchored near a tall and sturdy tree that was topped, limbed, and finally rigged with a pulley at the top. Then a cable was pulled out to the place where a log had been cut. This method brought logs back to a central point without the use of a chute. Sometimes a second spar-pole was set up on the other side of a gorge or canyon and logs could be ferried across an expanse of rough terrain. The Manuel operation apparently used both of these methods to move logs to locations where they could be towed or loaded onto trucks (Bob Porovich 1994: pers. comm.). After World War II, Mr. Porovich returned to work at the Manuel Mill. 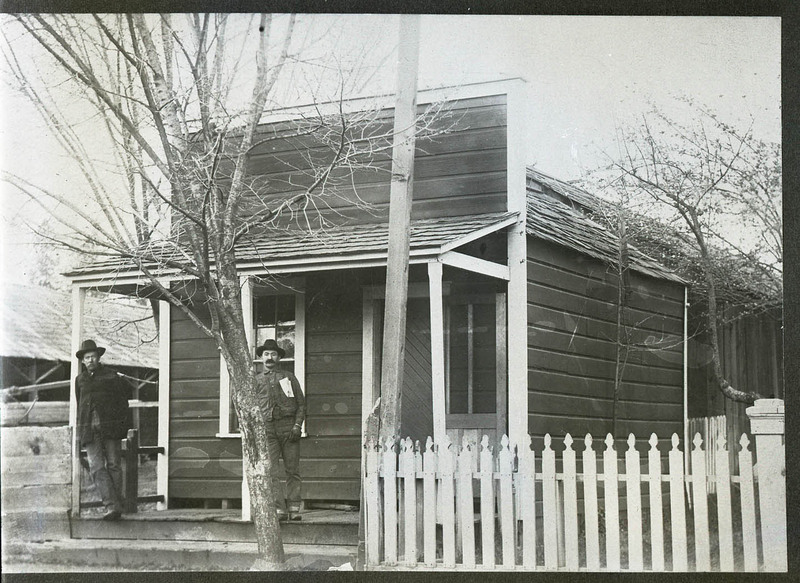 He drove each day from Angels Camp (also his present home) with “Jack” Manuel, who ran the mill during this period. Mr. Porovich remembers well that by the mid-1940s all donkeys except the one at the top of the railroad incline, across and above the millpond, had been replaced by small or medium-size caterpillar tractors. Unless timber was very close to the mill, it was loaded onto trucks instead of being towed down log chutes (Bob Porovich 1994; pers. comm.). One of the more widely known aspects of the Manuel logging operation is its use of traction engines. While no one appears to have photographed the Manuels’ caterpillar tractors, there are many pictures of the Manuels’ enormous “steam tricycles” with wheels eight feet in diameter. These huge and cumbersome tractors, adapted early in the century from agricultural use, were dangerous on anything but level ground because they were three-wheeled and could easily tip over on slopes, if turned sideways. By 1920 some species used treads to crawl along the ground, instead of gigantic wheels; but these also had a wheel in front to steer them. Like the prehensile tails of human evolution, the single wheels at the front were finally dropped, and the caterpillar tractor was born. (Cummings 1994:10). A great photo of the steam traction engine crossing a creek, we don’t know which one. Neither which tractor, nor which stream. The heyday of traction engines, such as the kind the Manuel Mill used for hauling lumber from San Antonio Creek to the yard at Angels Camp, was from the 1890s to the 1920s, with some outfits using them as late as 1930 (Cummings 1994:6). Bob Porovich says that when his brother, Chris, first worked at the mill in 1927, the traction engine had been replaced by the use of logging trucks (Bob Porovich 1994: pers. comm.). 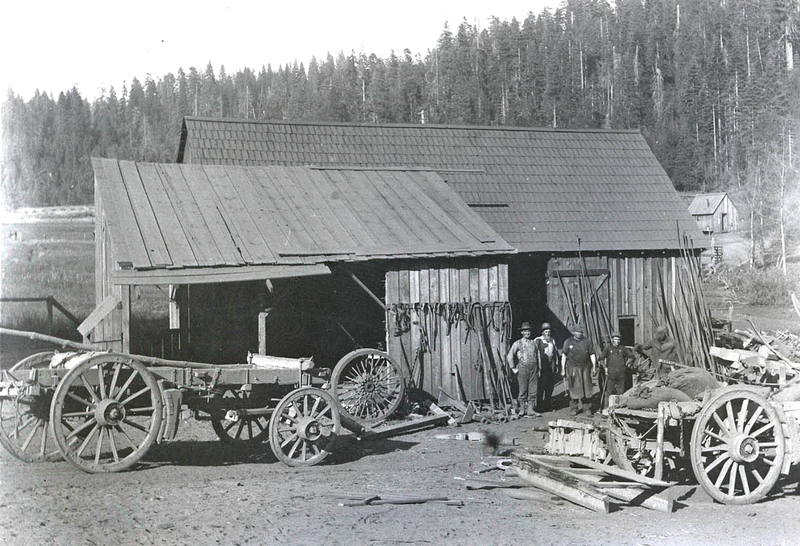 Only a few years earlier, before trucks were built strong enough to handle large loads, the Manuels had depended entirely on traction engines to pull as many as five fully loaded lumber wagons to Murphys and Angels Camp. By 1953 the entire logging and milling operation belonging to the Manuels had become old-fashioned, even if this fact might not have seemed evident to everyone at the time. Edwin Manuel says Matt and Jack had lost interest in the mill by the late 1940s. The machinery had become, over a period of 30 or more years, both antiquated and problematical. It frequently broke down, causing production to stop for hours or days. But the Manuel brothers had no intention of refurbishing the mill (Edwin Manuel 1994: pers. comm.). Compounding the incidence of breakdowns, both in the mill and in the woods, was the fact that many mill workers abandoned the Manuel Mill operation for work in other mills (Edwin Manuel 1994: pers. comm.). Ambrosio Castillo and Cecil Giles are former Manuel employees who left the Manuel Mill to work for Blagen Lumber (Ambrosio Castillo 1994: pers. comm; Cecil Giles 1994: pers. comm.). Unsafe machinery must have been a factor in such decisions. Buck Wilson lost all of the toes from one foot while working at the Manuel Mill. Others in the logging half of the operation had missing fingers and other disabilities traceable to old and hazardous machinery (Edwin Manuel 1994: pers. comm.). The Manuel Mill office in downtown Murphys, corner of Main and Algiers Streets. It is still there although it has served many different functions since it was the mill office. For some time it was the water company office. 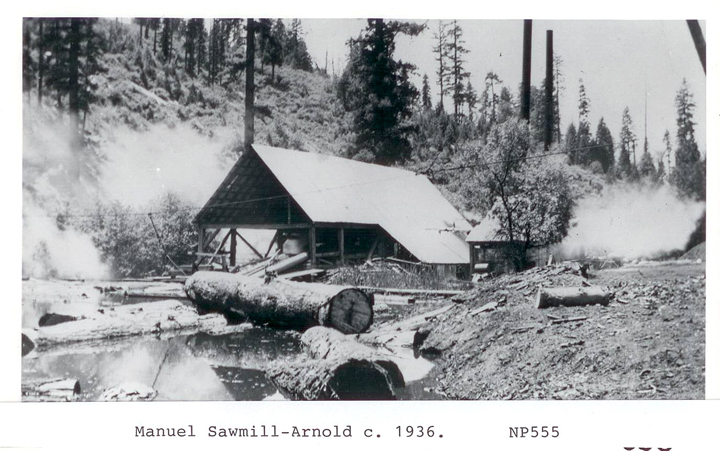 The Manuel Mill was apparently torn down before 1956 because a 1956 topographical map (Blue Mountain, CA Series) has the words “Manuel Mill (site)” printed at the former mill’s location. By 1956 the Blagen Mill, no more than two miles away, had already reached its peak and would close down completely by 1962, after 22 years of production (Howard Blagen 1992). This makes the Manuel Mill, after at least 30 years of operation, the oldest producing sawmill in Calaveras County. 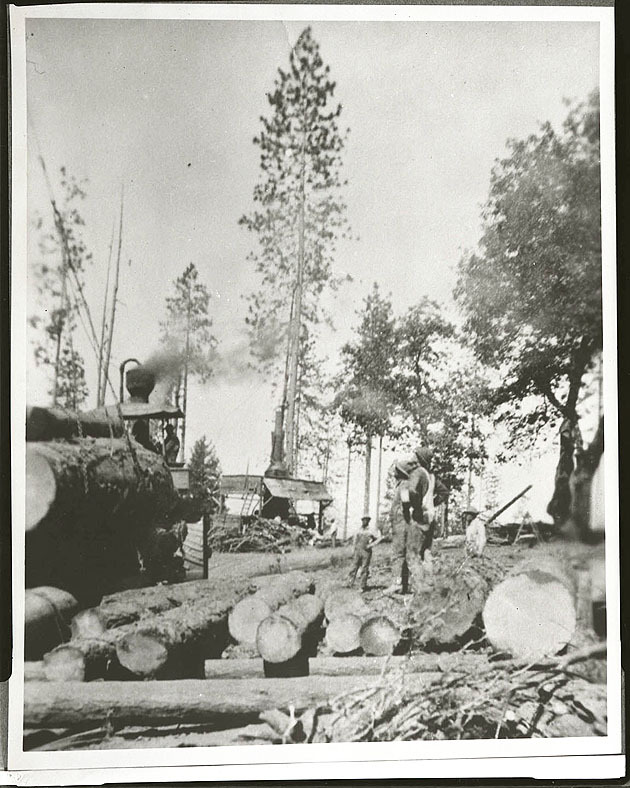 Starting in 1878, the Manuel family was involved in local logging, milling, and lumber marketing for 75 years. The Manuel Mill on San Antonio Creek was only one of several productive operations spanning three quarters of a century. 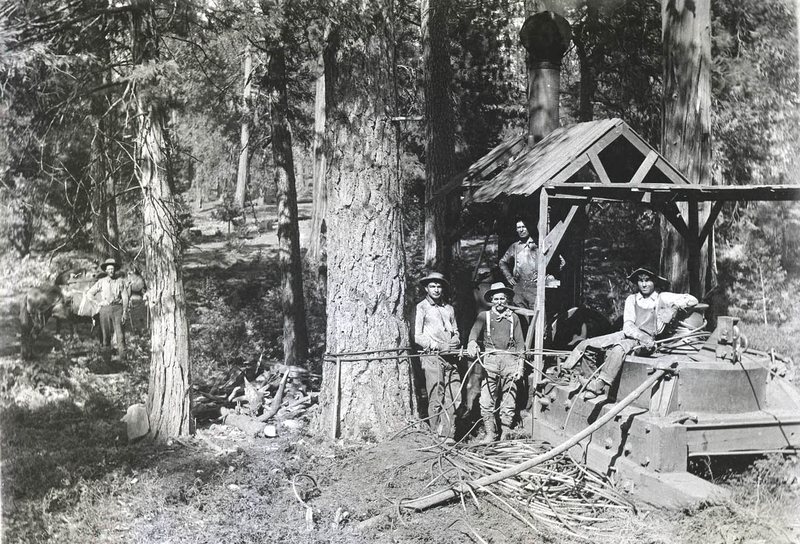 Hidden away in a canyon near the town of Arnold in Calaveras County and about two miles from the Blagen Lumber Company at White Pines is a sawmill that was the forerunner of the lumber industry in that region. In fact, this sawmill is the first built in Calaveras County and was one of the first large operating mills in California, at that time. Built in 1881 by the grandfather and father of the present operators the mill has run and produced lumber in quantity throughout the years and is today supplying the Stockton Box Company with box lumber. The original builder was John Manuel and his ideas and ways of manufacturing lumber installed in the eighties are still good milling practice, and as far as that goes their method of drying and yarding could be copied and used successfully today. In looking over this pioneer mill, it is very evident that a man with much foresight and business acumen had a hand in its structure. The management of the mill passed to his son and later to his grandson. Both of these gentlemen are actively engaged in operating the mill today. All of the owner-managers have been named John Manuel and there is also a great-grandson, age four, named John, who will probably grow up to carry on the family tradition of this pioneer lumber family. The mill located on the side of picturesque San Antone Creek was erected with ease of working and a minimum of operating manpower in mind. The sawmill is on flat ground and the adverse grades over which logs are hauled are slight. After the lumber leaves the trimmer it is stacked on flanged wheel cars and elevated five hundred feet over an eighteen hundred foot long incline track to the drying yard located on the top of a mountain. This site for the drying yard was selected because it afforded better air circulation, more hours of sunlight and a downhill haul-out to market for the dried lumber. The tracks are built higher than the level of the ground on platforms which facilitate the piling of green lumber. Another feature of locating the drying yard out of the valley where the mill operates is that lumber can be delivered all year around from there. In days gone by a railroad was built to freight out the lumber from the Manuel mill and also carry concentrates from nearby mines. 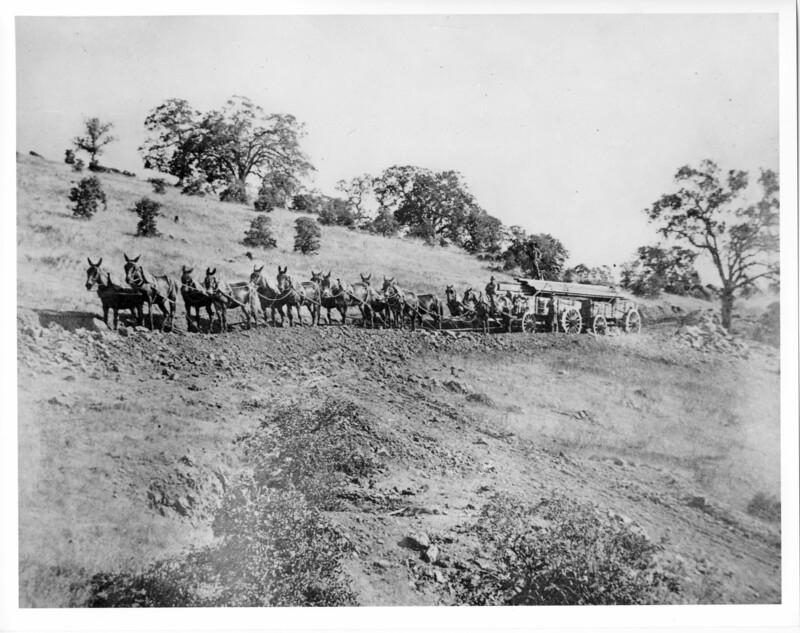 This railroad, called the Sierra, ran from Sonora to Angels Camp. At Sonora it connected with a line that extended down into the valley. 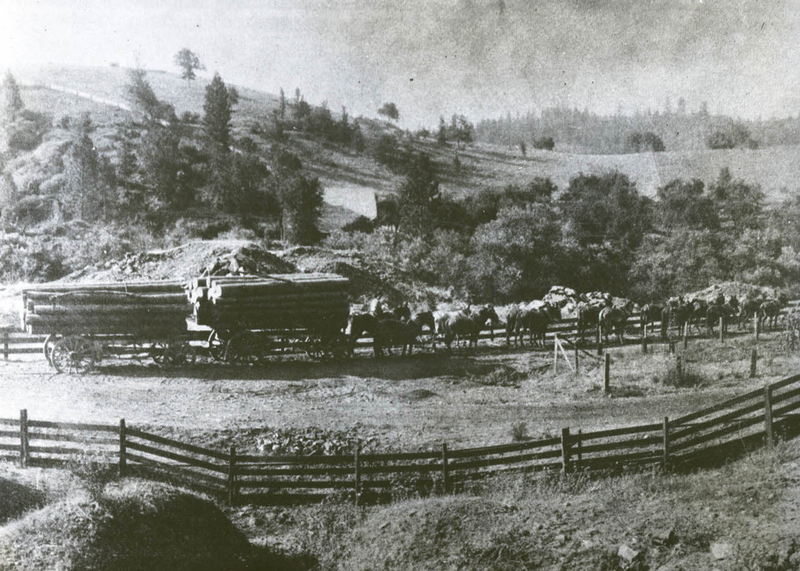 The distance from the railhead at Angels Camp to the mill was about 12 miles, and to transport the lumber from the drying yard to the railroad some unique hauling machinery was used. Lumber was hauled down by steam traction engines hauling five large steel-tired wagons. This train, so-called, ran over the rough dirt road and made a round trip a day hauling forty thousand feet of lumber. These steam tractors had immense 9 foot drive wheels and their overall height was over fifteen feet. Behind the tractor was hitched a tender which carried a supply of fuel for the trip. Originally they were fired with slabs but later were converted to use fuel oil. 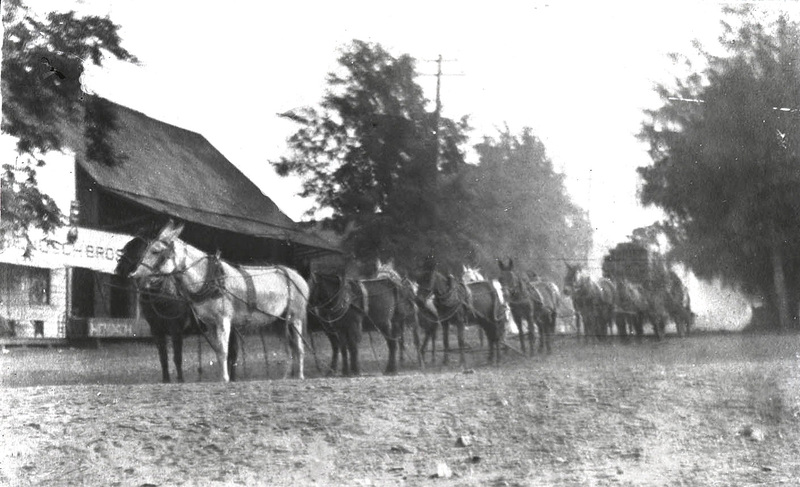 A crew of three made each trip on these wagon trains. An engineer who ran the rig and steered, a fireman to keep a head of steam up, and a brakeman who hustled back and forth handling the heavy wheel drag brakes used. These old tractors and wagons are still very much in evidence both at the old homestead in Angels Camp and at the mill. The head rig at the mill is two sixty inch inserted tooth circular saws. A five saw edger is used and a small planer is in operation in a building located at the drying yard. A crew of thirty-two is employed among them, Guy Supinger, sawyer, who has sawed there for the last fourteen years. Mr. Supinger is also the millwright and the day we visited the mill he was doing some overhauling of the equipment as they were shut down for the season. The early history of our organization is tied closely to this mill as some of the very first lumber purchase by Tarter, Webster,and Johnson was from this mill and as mentioned above they have been a steady supplier of shook lumber to the Stockton Box Company. Skipping one paragraph about visiting the mill. The Manuels are proud of their business and rightly should be as it is very seldom you find generation after generation carrying on the old original family business. If there was ever a family that rated a salute form the lumber industry the Manuels are that family. End of the American Eagle story. Your webmaster found it interesting that in the museum we have some fabulous prints of the Manuel lumbering operation, yet until 11/08 we had no readily available photos for the web site. The beautifully printed and framed photos in the museum came from the Six Mile Bowl, a bowling alley between Vallecito and Angels Camp built during the 60’s with money from the Manuel estate. When the bowling alley went belly up, the Logging Museum was fortunate enough to get the prints. Most of the Manuel Mill photos that are now on our web site are courtesy of the Old Timers Museum in Murphys. The website editor, or webmaster, actually both, is John Hofstetter. I came to teach in Murphys in the Fall of 1957. Matt Manuel was still alive and his youngest son was a student of mine. Matt and his wife Alfa were very kind to our rather impoverished young family. A few years later, when the Six Mile Bowl was opened, I bowled in a league with a number of loggers, some of whom are included elsewhere in the site. When I look at the museum’s wall of Manuel Photos, I am pleased that we have such an outstanding visual record of this operation, and some of the people I cared for. 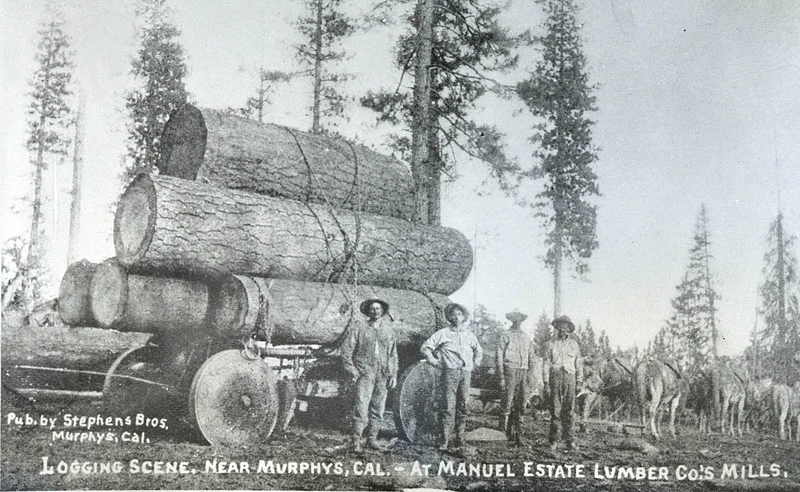 Were the Manuel brothers described above connected with the Manuel Estate Company that was associated with the Big Tree Timber Company and Standard Lumber Company in Tuolumne County? Mark, In looking over the comments on this page, I saw that I had tried to respond but hadn’t. I think the answer to your question is yes, but I’m not sure. The Manuels were involved in property as well as timber. Again, I’m not sure. Mark, the first photo on this part of the site is of a logging wagon near Murphys with the caption saying that this was the Manuel Estate Logging Company, so I think the answer to your question is a definite yes. I was interested to read the Manuel Mill posting. I heard a good deal about Matt and Jack and the mill as a boy. My grandfather, Guy Supinger, was the sawyer there for many years. I have the vaguest of recollections of the mill and visiteding it at age 4 or 5. Guy later worked for many years as the sawyer for Maury Rasmussen, at the Rassmusssen until Guy retired in his early 80’s. Guy lived to 104, taking care of himself until a few months before he died in 1986, fully lucid and himself until the end. I also recognized the name “Shorty” as he was the engineer about the milll and I recall hearing how he and Guy raised and fitted a tall new smokestack at the Manuels’ with just a winch and a gin pole. The mention of the decrepit state and danger at the mill rings true. Guy often fumed over Jack Manuel’s unwillingess to spend on equipment upkeep or safety. I look forward to visiting the museum and readingthe American Eagle article mentioning Guy which is discussed in the Manuels’ article. I mentioned your comment at the Museum’s Board of Directors meeting. i said that your grandfather was named Guy and that he was the sawyer for the Manuels. One of our directors, Dale Brooks, told me that I was talking about Guy Supinger and that Dale had known him well. Small world, isn’t it? I taught for 4 years at the Murphys School and had Matt’s son as a student. We were dirt poor with no social standing at all, but Matt and his wife were very kind to us. I only knew him as a very elderly man, but Matt was every inch a gentleman. Matt’s money at his death was put in a trust with the Bank of America in charge of seeing that it was cared for. With the bank’s approval, the money was used by Matt’s widow to build the Six Mile Bowling Alley in Vallecito. Wonderful facility, but couldn’t make a go of it financially. The bank was sued for giving bad advice (in essence) and had to replace at least some of that money. (This is mostly hearsay, so don’t take what I’ve said here as totally factual) Matt’s nephew, Matt, was a local school teacher also, and his family and mine pretty much grew up together. Another great article, thank you. Since we are getting so many with a tie to the Manuel Mill looking at this article, I have a request. Does anyone have information on the 1908 (September?) fire that burned into the North Grove of Calaveras Big Trees? The reason I ask is I have a source that states it started from a spark from Manuel Mill Steam Donkey when it was previously located where the current Fly-In Acre lake is now. Any information about that fire would be appreciated. Love these shots. Do you own the rights to them or know who might? Most of the photos you see here are the property of the Murphys Old Timers Museum. That’s in Murphys. I suspect that they’d be happy to sell you the right to copy some of therm as they, like us, survive on sales, memberships, and donations. My great grandfather was a Miwok loger! I know he’s one of those men!! Robert Ross was his name(white man name). You are probably right. The Manuels had a number of Miwoks working for them, and the Ross men were undoubtedly among them. When I first moved to Murphys, we rented from Mrs. Ross and her husband whose first name I don’t remember. Both he and she were at least partly native American. Wondering if anyone out there knows or would have knowledge to pass on to me on how to find out more detailed historic info on the Manuel family? Looking for info in particular about Carolyn “Carrie” Manuel and her marriage to Warren N. Garland and her untimely death. Understand she may have resided at a home, newly built in 1888 or 1889 on Main Street in Murphys and died there in 1891? Wondering which house it is/was and if it is still there? Anyone with any leads at all would be incredibly appreciated. You bring up some interesting questions in history. I have 2 suggestions. The Calaveras County Historical Society has access to land parcel maps. They were able to tell me, for instance, that the wood water tanks in Blue Lake Springs (Arnold) were built in the 1960’s. The second source would be the Calaveras Heritage Council. Also, the Angels Camp Museum may help and Bonnie Taylor and Judith Marvin of the above links are incredibly knowledgeable. Good luck and please post what you find here…I am really curious now. Besides the resources Nancy mentions, you should try the Murphys Old Timers Museum. Our museum has a lot of Manuel photos and some old relics, but not much family history. What history we do have is all pretty much on the web site. I know that the Angels Camp Museum has a lot of Manuel stuff, and I think that the Murphys Old Timers Museum might also. Coke Wood who wrote much Murphys history and founded the Old Timers Museum lived during the time some of the older Manuels were still alive. I would think he gathered what he could. The large house,at least it used to be a house, on the corner of Main Street and Algiers was the Manuel home. The little building on that corner was the Manuel Lumber Company’s office. I don’t know if that home is the one you were talking about, but I think it goes back a long time. It was already old and rather grand when I was a little kid in the 30’s. I used to go there to play with Matt’s stepsons who were about my age. If you go to http://www.malakoff.com/goldcountry/murphys.htm you’ll find a mention of the great fire starting at the Manuel-Garland store. The store and livery stable were directly across the street from the Murphys Hotel. A photo of the Garland Stage Stop and Stable in in the April 8, 2015 Calaveras Enterprise. The photo is credited to the Angels Camp Museum. I had never seen it before. My Great, great grandmother was born at Kimball Mill before it became the Manuel Mill. She was full blooded MeWuk do you have any history on the Native Americans that resided and worked at the Mill? In the comments above, I’ve told you about all I know of the MeWuks that worked at the mill. We’d like to know more and also more about the Kimball mill. In regard to other Native Americans, we have quite a bit about “Chief” Walker on the web site. Also some great photos of him, and a great story about his early demise which wasn’t, as it turns out a demise at all. Search our site if you’re interested. I’ve put a new post on the web site that talks about the indigenous people who were in the area at the time of the early mills. Do a search for Sandy Gulch Mill, and open the one that says it was done for CCWD. There’s a lot there, but you can keep reading until you find the part about the Native Americans.